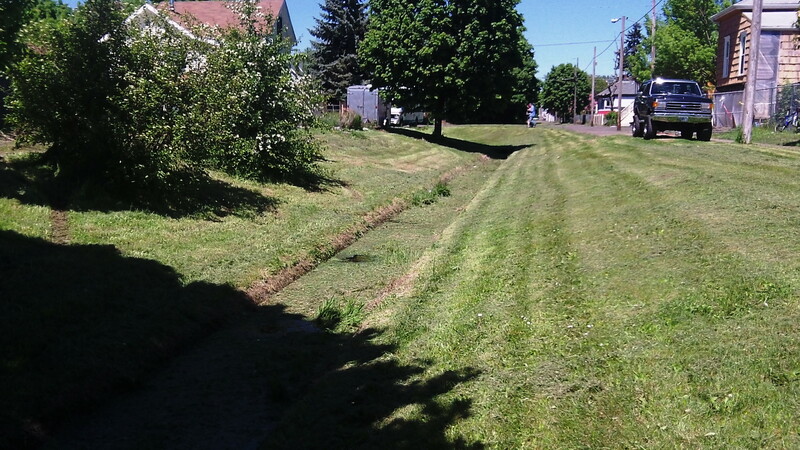 » Where did the ditch go? Where did the ditch go? You can barely see it because what little water it has is clogged with cut grass. Nobody seems to love what’s left of Albany’s Thurston Street Canal. Decades ago it was turned into a narrow ditch. The water flow is very sluggish. Now somebody was kind enough to cut the grass on the banks. 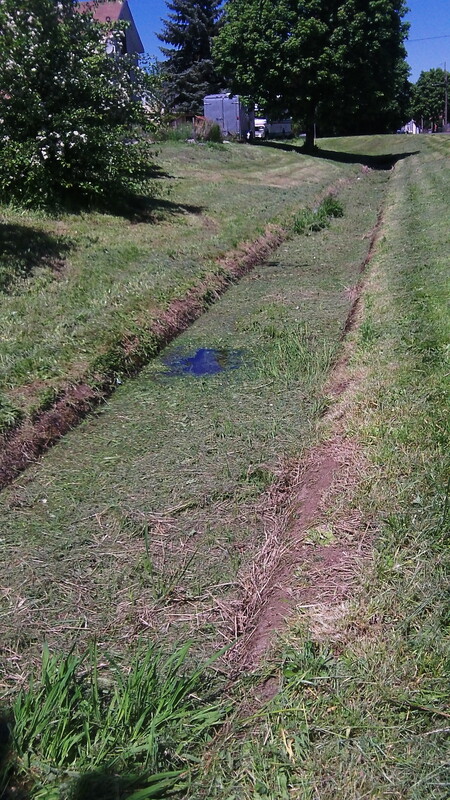 But look where the cuttings ended up: In the ditch, making an already stagnant waterway even more so. Twenty years ago Albany’s Town Center Plan envisioned making use of Albany’s canals and turning them into assets that would help give the central area an economic boost, which the district on both sides of Thurston Street could still use. But as I’ve mentioned in this space, the canal element of the plan has been all but ignored all these years. It’s the Santiam Canal that feeds the Eighth Avenue Canal, which is partially covered up but eventually makes its way past Swanson Park and then turns north along Thurston, headed in the direction of the Willamette River. Most of its flow is underground in a pipe. At a recent downtown urban renewal meeting, one of the city council members said the city should check whether it has the water rights to keep the secondary canals flowing. Whether it does or not, in the places the waterways resemble natural streams — because of neglect, mostly — they might harbor some aquatic creatures. Maybe some of those could be considered threatened. That would mean nobody could turn off the flow regardless of water rights. And the system of urban waterways might then get the attention it deserves. Spend CARA money on ditches? Now that is a public meeting I wouldn’t miss…..
We do need more mosquito breeding areas- NOT!